There is no better way to hang your acoustic or electric guitar! This is a NEW, hand crafted, professionally finished instrument hanger that will proudly display your guitars, banjos, basses, mandolins, and other stringed instruments while keeping them safe & out of the way from harm, works on all guitars! Proudly made in the USA. The steel hook is rated to support up to 50 pounds, can be rotated to any desired angle, is foam coated, & will not mark the finish of your instrument! A typical acoustic guitar will have an inch clearance between it's base & the wall when hung, more than enough room. 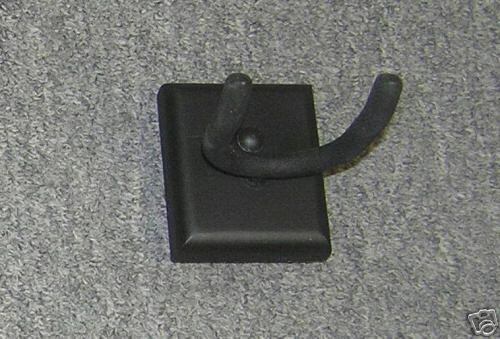 All mounting hardware is included to allow you to mount to drywall, plaster, wood, cement block, etc. A matching button is provided to conceal mounting hardware. Easy step-by-step instructions clearly show anyone with a screwdriver how to install it in minutes!